This joyful LED lamp will brighten smiles and spaces with a heart-shaped "O" and red cedar base. Did the room just light up? Must be love. 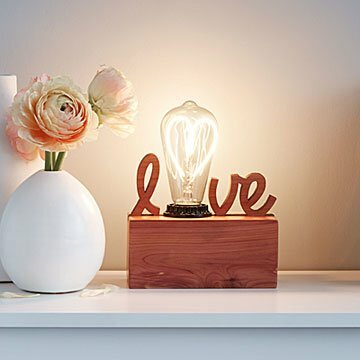 This joyful LED lamp will brighten smiles and spaces, with affectionate details like a heart-shaped "O" and red cedar base. Add modern romance to a side table, bookshelf, or wherever you want to share the love. Made in Huntsville, Alabama. Total cord length: 15 ft. PLEASE NOTE: This item is built to U.S. electronics specifications and may need additional modifications or converters to be used in countries other than the U.S. and Canada. Lovely wood and Edison light bulb.